Arguably the most common, and certainly the most frustrating, seedling disease has to be damping off. 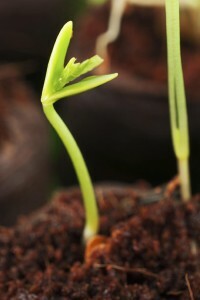 Damping off is a common term used for several fungal diseases that cause sudden seedling death. Seedlings get very thin where the stem meets the soil. Young seedlings will then fall over, shrivel up and die. The loss of an entire seedling crop can devastate your gardening plans and set you back several weeks. If the infection is severe enough, you may lose entire types of seedlings because there will not be enough time left in the growing season for new seedlings to reach maturity. Sterilizing all seedling containers with a 1:10 bleach solution between every use, and sterilizing them again if they’ve gone unused for a long period of time. Use a sterile seed starting mix so there are no fungal spores or other contaminants in the initial soil. Plant seeds on the soil surface and top with vermiculite, milled sphagnum peat moss, chicken grit or sand to minimize fungal invasions. A one-time sprinkling of cinnamon or charcoal on the soil surface will act as an anti-fungal agent. This should be applied after seeds are planted. Water containers from below allowing the surface of the soil to dry slightly between watering. This prevents moisture on tender leaves and stems that can lead to rot. Provide good air circulation around seedlings with a fan on a low setting. This will help leaves and stems stay dry and firm. Spray seedlings with a cooled ounce of strongly brewed chamomile tea added to a quart of water. This is a mild anti-fungal home remedy. If you notice seedlings start to succumb to damping off, it may be best to quickly thin them out or sacrifice the infected part of a tray rather than attempt to save the seedlings and risk spreading the disease to more young plants. While this will reduce your crops somewhat, it is better than risking the loss of an entire flat of seedlings. If you catch the symptoms quickly enough, it may be possible to sterilize the planting containers and start again to regrow the seedlings you have lost.